When I realized what my latest Lectio assignment was, I groaned. “This isn’t an easy gospel,” said I. Others reacted the same way: “Wow. Not an easy one!” So true. So easy to say. Well, too easy, really. In fact, we kid ourselves if we think that any gospel is “easy.” A gospel passage may be clearer at first reading than this story from Luke, but “easy” isn’t the right word for it. Stories like those of last Sunday – lost sheep, lost coin, lost boy – offer us challenges that we may not see right way, but they’re there. In a way, today’s gospel, with its “dishonest” steward and Jesus’ seeming endorsement of his accounting dodges, does us a favor, since it doesn’t lull us into thinking we’ve got it after one reading or hearing. Instead, it invites us to be alert to any clue that might help us understand, since a quick glance isn’t going to yield much at all! In our story, it seems that the rich man isn’t too involved in his property, since somebody else (who’s not named) tips him off that things aren’t going so well. The absentee landlord is never a sympathetic figure and neither is the snitch, whether to Jesus’ listeners, who knew all about such people from their own lives in occupied Israel, or even to ourselves, his latter-day listeners. It’s interesting to notice, too, that Jesus doesn’t really say that the steward was, in fact, “wasting” the master’s “goods,” but simply that the master believed the accusation and called the steward on the carpet. There’s no dialogue between the two – just a demand that the steward render an account and get out. No dialogue, but there is a monologue: we’re allowed access to the head of the steward as he sits chewing on his quill as he contemplates a future with pick and shovel. Jesus’ technique of letting us listen to his interior workings seems to create some sympathy for him. Digging ditches after a cushy desk job is quite a comedown; it could even kill him. And then he hits on his plan – brilliant! Or is it? Here’s where our contemporary standards may cause us to shy away from our almost-hero; we can’t quite imagine Johnson down in Finance fiddling the books like that – or if we can, we think he’d better be locked up! 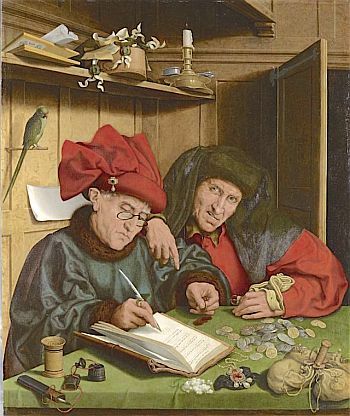 "The legal system presupposed by the parable. . .is contrary to the OT ban of usury. The steward was authorized to make binding contracts for his master. The usurious interest on oil and wheat, for example, would not be listed separately in the contract. It would be included in the one lump sum mentioned in the contract. Thus, a person may have obtained only 450 gallons of oil, but because of the 100 percent interest charged, had to have 900 gallons written on his contract. There is no evidence that the steward could pocket the interest as his commission; the steward’s job was to make money for his master." The New Jerome Biblical Commentary, 708. The steward’s plan is simple and two-fold. He’ll get even with the master by cutting into the master’s huge profit margin and in the process he’ll also store up goodwill for his own day of need. Neatly done, Mr. Steward! That’s what Jesus says. He’s shown us someone who wasn’t dishonest at the beginning, someone who was set up by an enemy. His behavior only becomes “dishonest” when he tells the debtors to cut into the interest that they owe the master – he’s a little bit like a Palestinian Robin Hood here, taking from the rich in a way that benefits both the debtors and himself. Cue Friar Tuck and Maid Marian! But the credits aren’t rolling just yet; there’s a little epilogue in which Luke shows us Jesus commenting on what he’s just told them, and if we insist on simply understanding Jesus to be advising us to be dishonest, we’re in for a big headache. So let’s not entertain that idea. Jesus never encourages wrong-doing, for any reason. But Jesus does advise us to look at the steward’s alacrity in finding a solution to a big problem – that’s what smart people do, at least in business. He contrasts such business smarts in dealing with a problem to the lackluster response that many of us give when we’re confronted with the “problem” of living our Covenant with God well. Jesus votes for the lively, energetic reaction we see in the steward. The steward realizes that his life is on the line; he’s going to be out on the street with a tin cup in just a day or two, and so he acts. We, on the other hand, often seem not to realize that our lives are on the line as well. It’s not that God is going to bellow “You’re fired!” at us. But in fact, these days and weeks and months and years are all we get. One day they’re going to come to an end. How are we living them? With the kind of intensity shown by the steward? With the kind of total giving modeled by Jesus? Easy? Not really. Worth it? You bet!